Drawing from the scriptures, we seek to live in harmony with God’s gifts and purposes. Brethren have a long tradition of “gathering around the Word.” We value the whole Bible, and are diverse in our understandings and applications of scripture. With the New Testament as our only creed, we try to be guided by the way of Jesus. A warm and welcoming congregation, we celebrate being an extended family. Times of joy and of struggle are shared as we support one another. Each Sunday, worship includes a time of lifting these celebrations and concerns up in prayer. Deacons organize help with food, rides, or calls when there is a special need. Members of the prayer chain get email messages or calls when prayers are requested for people inside or out of the congregation. Worship is central to our life together. So is a manner of living characterized by service, the pursuit of justice, and peacemaking. All these we believe to be most possible when part of a gathered community. We are sustained by worship –music, prayers, readings and reflections from the Bible, tapping the richness of the arts, and sharing our lives in the presence of God. Baptism is a choice to affirm faith in God and to follow the way of Jesus in the company of others. We baptize older children or adults who make a decision to commit themselves to Christ and to join the church. When a child is born, a family may come before the church to be consecrated. Parents dedicate themselves to offering their child the teachings and love of Christ. The congregation prays for God’s blessing on the baby and the family. Later, after one is able to make a deliberate, thoughtful commitment, a believer may choose to be baptized. In accordance with the example of Jesus, and in response to a decision of faith, a person kneels and is immersed three times in the water of the baptistry (or sometimes, of a river.) This symbolic act is, for us, a sign of willingness to give oneself to God’s grace, and to take on both the joy and the responsibility of living Jesus’ teachings. Done in the company of the church, it is also an expression of becoming a member of the congregation. Love feast, footwashing, & communion are profound central symbols of the richness of life together through Jesus Christ. When Jesus shared his last meal with his disciples, he washed their feet, ate supper with them, and offered them the communion of bread and cup. 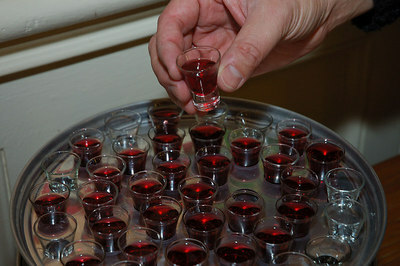 In our congregation, we celebrate communion about four times a year, two of those in the service of Love Feast, which recalls that last supper. A simple time of self-reflection leads us into circles of chairs. We sit and wash each other’s feet, in accordance with Jesus’ example, and as a sign of humility and willingness to serve. Often we sing as we gather in the footwashing circles. Some choose to hold a basin and towel for others to wash their hands as an alternative to footwashing. Afterward, we exchange an embrace and a word of blessing. In this symbolic act, we recognize that Jesus calls us to give and receive without care for status or position. And in it is also a reminder of the call to serve each other and the world by offering ourselves in love. Love Feast closes with a hymn and cleaning up, in which all are invited to participate. When we leave the feast, reunited in our dedication to Christ and to each other, deep nourishment often goes with us. Anointing is a time to call on the healing power of God. When there is a request or a need for healing, we practice anointing: the prayerful, loving application of oil to the forehead of someone in physical or spiritual need. Often taking place in a home or small-group setting (but also sometimes in a worship service) anointing calls on God, not so much to cure as to make whole. We recognize that we are broken people in many ways, only some of them related to physical health. Anointing is a powerful act for people suffering illness or facing surgery, but also for those who know grief, confusion, or the need for healing of relationships. As the anointing begins, a time is provided for acknowledging barriers that might prevent wholeness. Then the minister or other representative of the church applies oil three times to the forehead, symbolizing forgiveness of sin, strengthening of faith, and healing of body, mind, and spirit. Finally the minister lays hands on the one to be anointed, often inviting others present to do the same, and prays specifically for this person’s expressed concern. The laying on of hands is a reminder that the whole congregation, whether present or not, joins in prayer and support. We understand the love of neighbor to reach our own community of faith, our neighborhoods, and sisters and brothers across the globe. Our congregation seeks to support efforts in our community and beyond that build justice and serve others. The church-owned hospitality house has hosted refugees, people displaced from Hurricane Katrina, and those in transition from homelessness. Our yearly Christmas Sharing Fair markets gifts from non-profit and fair trade groups as we encourage alternatives to the unbounded commercialism of the season. Special projects to assist in disaster response and relief often find us assembling and sending cleanup, hygiene or school kits. We support local organizations serving those in need, sometimes serve meals at the Washington City Church of the Brethren soup kitchen, and have participated in the community effort to provide shelter for the homeless through a rotating winter shelter. Members of our denomination have been instrumental in establishing and undergirding national and international programs to meet human need. 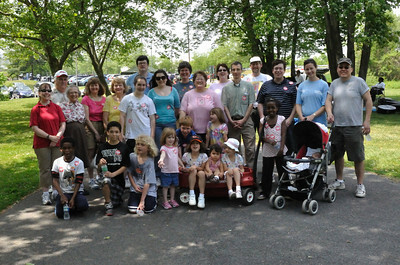 Church World Service operates from our Brethren Service Center in New Windsor, MD. Brethren founders and supporters have played roles in Heifer International, A Greater Gift (SERRV fair trade marketing for craftspeople in developing countries), CARE International, and other agencies. 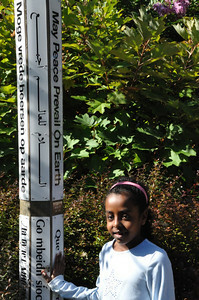 Peacemaking is a response to the call of Christ to build bridges of reconciliation in conflict. Jesus chose the way of nonviolence and love of enemy. Brethren have understood this way as one to which we are invited. Our denomination is one of the historic peace churches (along with Quakers and Mennonites.) We believe that following Jesus means choosing nonviolence, even in times of war or conflict, and lifting its possibilities before neighbors and nation. Declaring that “all war is sin,” Brethren recognize that armed conflict never reflects God’s will for humanity. 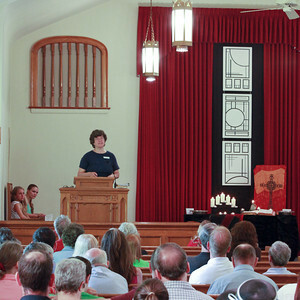 Our congregation has been instrumental in and supportive of neighborhood efforts to speak out against war in Iraq, and to advocate for alternatives to military action in the world. We also seek to embody these tenets in our daily lives on personal and congregational levels. Even in the awareness of our limits and failings, we welcome the word that invites us not to return evil with evil, but to join in the work of reconciliation. ~and extend Christ’s way of peace.